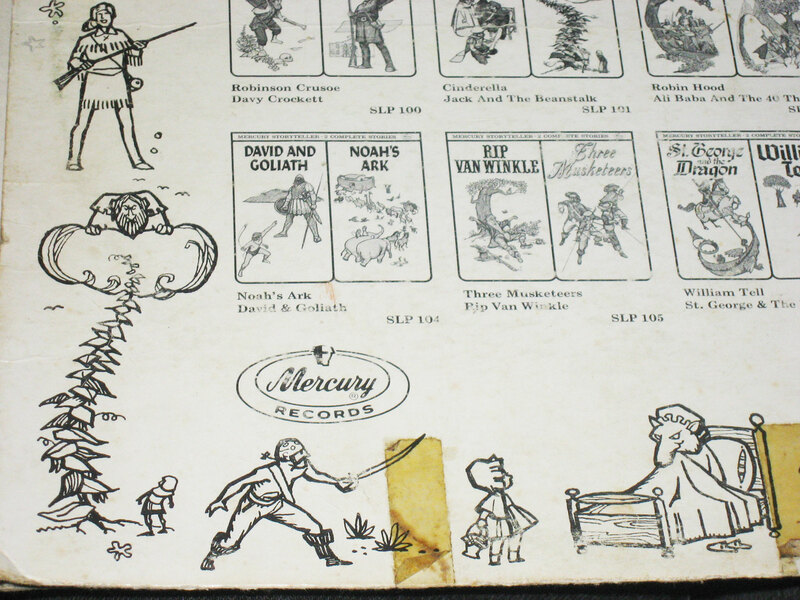 Mercury Records and Beck-John Productions put out a series of children’s records in the ’60s called Storyteller which were “Dramatically enacted, accompanied by a 40 piece orchestra”. Each record had “2 Complete Stories”. The pairings were “Robinson Crusoe” and “Davy Crockett”; “Cinderella” and “Jack and the Beanstalk”; “Robin Hood” and “Ali Baba and the 40 Thieves”; “Hansel and Gretel” and “Sleeping Beauty”; “David and Goliath” and “Noah’s Ark”; “Rip Van Winkle and “Three Musketeers”; “St George and the Dragon” and “William Tell”; and “Goldilocks and the Three Bears” and “Tortoise and the Hare”. We had the last one, whose catalog number was SLP 107. I listened to it so many times as a kid that certain lines of the narratives, and certain passages of the scores, and certain images that were painted in my little brain at each repeated hearing have remained with me all my life. The word “columbines” held a magic for me long before I knew what columbines were or what the flower looked like. The phrase “I’m scot nared — I mean…I’m not scared” gave rise to that knock-kneed spoonerism’s use in our family throughout my life. Somewhere among my parents’ photo albums is a black and white photo of me sitting on the floor — with legs bent back on either side in that impossible way four-year-olds sit — in front of the huge cabinet phonograph that we had in the living room under the copper-colored clock. I think I am listening to “Goldilocks and the Three Bears” or “Tortoise and the Hare”. The stuff dreams are made of. Detail from the back of SLP 107's jacket. The narrator in these recordings talked a lot and said funny-sounding things I didn’t understand before each story and at various points in the tale. He said, “But I’ll just tell you the story and let you draw your own conclusion. Have you ever drawn a conclusion? Or would you rather draw a house with a chimney? Oh, now that’s a silly question isn’t it…now where were we?” At that age, I did not yet register puns. As such things tend to do, this vinyl recording and its sleeve and tattered jacket fell into disuse after a time and languished in a box of other recordings — Johnny Appleseed, Pinnochio, The Chipmunks. Considering the untold numbers of things that I once owned, or my sister or brother once owned, that we in any case collectively cherished, that “went away” over the course of our first three decades, it is a miracle that this recording managed to remain in the house in south Bellevue where I grew up until sometime in my late thirties or early forties, when I found it and brought it with me to join the collection of albums, already a museum, that I had chosen as a self-differentiating youth — Al Stewart, Alan Parsons, Supertramp, Genesis, Renaissance, Triumvirat — and those that represented my later, expanding musical taste — John Williams (the guitarist), the Pretenders, the Boys o’ the Loch, Joni Mitchell, Rod Patterson and the Easy Club, the Stranglers. I’m looking at SLP 107 now. The jacket is now two separate pieces of cardboard, though matching pairs of yellowed strips of celophane tape on both halves still show where some effort was made to keep it together. The back has ink drawings around the edge of various scenes from the stories. I dug it out this morning after the three of us got up. Saturdays Mara gets up and comes into our bed, and the cats join us, and we all loll around and tickle each other and sometimes Mara asks one of us to tell a story. It’s a weekend treat, since I don’t have to get up in a rush. Today I told the story of Goldilocks as I recalled it from this recording from my childhood. It went over big, so I went down into the garage and brought up a turntable that belonged (still technically belongs) to an old roommate of mine and hooked it up to our stereo. It was a moment of strange beauty for me when I lowered the needle on this venerable vinyl platter and the old familiar music started. It was a moment of even stranger beauty when I stood looking down at Mara, who, after a few minutes of rapt attention to the spinning label and the odd machinery of the needle arm, curled up on the floor and entered for the first time a world that I remember but can no longer reach. I can see her going but I'm not allowed to follow. Just for the record (no pun intended), I thought that Matthew’s re-telling of the story this morning in bed was hysterical. A beautiful picture, a beautiful photograph! I remember my folks had a Sony reel to reel tape machine, and a recording of Peter And The Wolf. If I only still had them both. “I can see her going but I’m not allowed to follow”. That kills me. Photo too. What a wonderous and poignant moment that captures. Why can’t we follow? It’s so much more fun there. Thanks Ang. 😉 It’s good to hear that from my storytellin’ copilot. Kip I remember the reel-to-reel. Didn’t we record some smoking guitar jams on it? Or did we just talk about recording some smoking guitar jams on it while downing our third can of Pepsi each and opening another bag of Doritos brand nacho cheese flavored tortilla-style chipss? Marni, I reckon we can follow in a sense by enabling and nurturing the imaginary landscape of the next generation. That’ll have to do. Upon laying eyes on the title, I immediately recognized the label and code number. Mercury records. Images of Smothers Brothers, Uriah Heep and BTO records danced in my head. I also recognized the turntable – a Technics. I still have mine (sadly, in storage). The drawings on the back of the album looked very familiar to me, as if I had gazed upon them before. But I´m unable to reach back into my personal database and access more information. Sweet story and photo. I love the splash of sunlight on the floor. I too want to follow. Louis, when I read this: “Upon laying eyes on the title, I immediately recognized the label and code number. Mercury records”… I thought you were speaking in Mickey Spillane Private-I-speak, thinking that you were commenting on how absurd it would be for the obscure title to mean anything to anyone. Then I realized you actually were serious, that you recognized it as a catalog number for Mercury Records. I almost sketched another panel. The turntable belongs to my old buddy Rich, with whom I roomed. I also still have my old Sony direct-drive — the first and only turntable I ever owned — which still works except that it speeds up and slows down a little. They don’t make ’em like that anymore. Matt, I think we talked about it, and actually recorded stuff on another machine, because I’m pretty sure we recorded SOMETHING! I’m glad you remember the reel to reel, it was the amp for my tuner and 8 Track for a looooooong time. I don’t remember when I was given the amp, but that R 2 R was the BEST! Funny, too, I’ve switched to Coca Cola now, but the Pepsi has all the memories. Coca cola, huh. Well, I guess. (grumble grumble). Pepsi weakened their formula in 1991 anyway. They never admitted it, but I know. You used to get a really solid nose-burp after the first long swig. No more. Stuff is namby-pamby now. Yeah, we recorded stuff. I think I still have stuff on cassette somewhere. Maybe someday I’ll figure out how to digitize it. How could I not remember the reel-to-reel? There may be a post in the offing that will quite put an end to any privacy you might have thought your attic bedroom afforded you. I’ve got pictures and stories galore. You’ll have to bring that along at our next family ‘do’ and we’ll all listen! My ‘adult’ kids would love it!! Believe it or not, no turntable necessary. This is kinda sad in a way, but I made the mistake of googling up the series, and I found this website (http://www.artsreformation.com/records/) that has not only the Mercury Storyteller titles but a bunch of others, too. Download takes about a minute for one record, and there you have it in MP3. I know…it’s just not the same. Actually, I think your idea is good. I’ll bring the tattered, crackly old record and if you have a turntable, I think the fam really would enjoy it as an event. The Attic is fair game! I finally retired my first turntable, the one purchased from the Radio Shack by the Jack In The Box in Bellevue…I think it’s still there! I now have a turntable with a USB jack. I have taken some of the old favorites, Triunvirat, Alan Parsons, and others, and magically placed them on the Ipod, scratches and all. It is magnificent to listen to these gems while mowing the weeds in the back, or going for a brief run. I have also found cool old time radio programs on the web, including the CBS Radio Mystery Theater. Coke doesn’t give the same burp as the Pepsi used to, but you’re right, the Pespi isn’t the same….doesn’t produce the same expurgation as in the past. Wait a tick! You don’t mean you’re recording analog straight to digital, right off the changer? Gor, blimey! Do you realize what that means? You could get a digital version of Genesis’ Match of the Day, which was on Spot the Pigeon, the large 45, and as far as I know, never released on CD (and if so, ganz rare to find). I guess you audio guys are full of nifty tech like that. Color me impressed. That’s the hi-fi holy grail I’ve been searching for. I had a Pepsi the other day. The first one in who-knows how long. I took two sips of it and thought to myself, “what´s the point?” It had the cola taste, but it lacked that – as Matt puts it – nose-burp that unfailingly presents itself with the first swig of Coca-Cola. Coke is extremely popular down here. I believe the stocking of Pepsi on the supermarket shelves is merely a polite formality. Kip, that Radio Shack is still there! When I was back home in April, I bought an external hard drive from them. Do you remember Radio Shack´s Battery Club? One had a card and would receive a free battery (or batteries) after the purhchase of a dozen or so batteries..
Matt, you cracked me up with your Mickey Spillane observation. I think we should create a graphic novel..in this comment thread alone I´m seeing a couple of more characters..
(er, Matt..see that possessive-gone-wrong, “Radio Shacks´s”? Could you get that for me, please? Thank you..most embarrassing. I’ll see if I can scratch out a panel for that scene. Problem is my art lacks finish. It’s all sketchery. I used to paint, but I was never trained in the actual technical skills of line drawing. My brother Ben was the ink man, though now he works mostly in water (ba dump bump – thanks, you’ve been a wonderful audience. I’m here ’til Thursday, try the veal). Interesting about your possessive fiasco. Was reading only a week ago about how the apostrophe in English usage is slowly migrating away from the possessive in favor of use as an indicator of plural. Book’s. Dictionary’s. Make’s my skin crawl. I’ll fix your boo-boo. Yes, another Battery Club member! And yes, Matt, I could digitize Spot The Pigeon, if I had said disc. It truly is a wonderful thing, although I have not tried it with my Mac. It is hard to get the laptop away form the wife long enough to record an entire album into the computating apparatus. louis, are the formulas for Coke & Pepsi the same in your location as they are here? I keep hearing they are different in different countries (or is that country’s?). I’ve bee told the Coke in Mexico is better than America….something aboout real sugar! This is where I get to chime in, Coke being my “thing” and all! Yes, in the good ole U S of A, we sweeten our beverages with High Fructose Corn Syrup- I believe it started as a way to support the farmers, now it’s just an insidious, bad-fer-you plague that has taken over our food and drink products. The Mexican, Canadian, European version is straight cane sugare- and yes, it does taste exceedingly better; less thick and syrupy (duh), and somehow cleaner- but that could just be my mind playing with me. If you have a Whole Foods or a PCC or something along those lines over in Boise, you can probably find it there…..try it, you’ll like it Mikey. that’s sugar. not sugare. although maybe it is, someplace. I thought you said sugare on purpose. Never admit a mistake that will fool most of the people most of the time. Kip, I’m scheming how to get you and your magic turntable over here without anyone missing work. It’s like that riddle of how to get the duck, the fox and the corn over the river in one canoe but you can only take one at a time. If the apostrophe can be changed to an indicator of plural, I vote that we change the spelling of “sugar” to “sugare”. Speaking of which, I must check the ingredients here to see if they use real sugar or fructose. Matt, re: your nightclub act, I´d like to add the sound of ice in a tumbler, a little feedback and a smattering of chuckles with one big laugh from a lady sitting in the back who´s smoked too many cigarettes. You got the dingy nightclub reference, I see. Marni, Boise does not have a Whole Foods in Boise. We were going to get one, but alas/alack, the economy went south with our store! Matt, I may have a way to get you in touch with a magic turntable much like mine! Maybe even mine! Look for a detailed email soon…..
I’m already sorting through old platters to see which ones get into the lifeboat first. Finally I can digitize the one song on Jean Michel-Jarre’s “Cosmic Messenger” that I want to keep (Puppet’s Dance) and get rid of another square foot of stuff that I’ve been dragging around for thirty years. Oops. I don’t mean Jean Michel Jarre. I mean Jean Luc Ponty. I was trying to find these records online because I had them as a child too. Your post led me to the website of downloads and now many families with kids have cd’s of these great stories. The children love them, all thanks to your post! Thanks for this very affirming comment and I’m glad these stories are circulating again. I went by your blog for a quick glance as I always do when someone new comments (because you just never know). It turns out that your blog is exactly what I’d intended mine to be…notes and thoughts about soil and faith and all things between, but rooted, as it were, in the home garden. My blog slipped away from me and became this other thing. I also see you list “The Searchers” as one of your favorite movies and for that alone, you are welcome back here anytime. I really like your site too. In fact you inspired me to expand beyond the garden to include more of the “out of the garden” part of my life. As for the Searchers, it’s a masterpiece, probably Wayne’s best work , thought True Grit and Liberty Valance should be close. The thing that sets it apart for me is what it doesn’t say but leaves for the viewer to feel. The kiss on the sister-in-laws forehead, the look on the brother’s face at the gold coins, those are the moments that sell that movie for me. I’d watch a toothpaste commercial 1000 times if Ward Bond was in it. Thank you for the trip down memory lane. I too listened to those records. I have a really big favor to ask. I found the MP3 files of the records and plan to surprise my wife with a cd of some of them. I was able to find the album cover for Arabian Nights(SLP102) but would love to get the cover art as a jpg file for (SLP107)Tortoise and the Hare/Goldilocks and the Three Bears and (SLP102) Robinhood. Could I ask you to scan the covers and send them to me? I know it is a huge favor. I would be happy to pay you. I only have SP107. I’d be happy to scan the cover for you no charge if it would fit in my scanner, which it won’t. Let’s take this offline…I’ll email you. 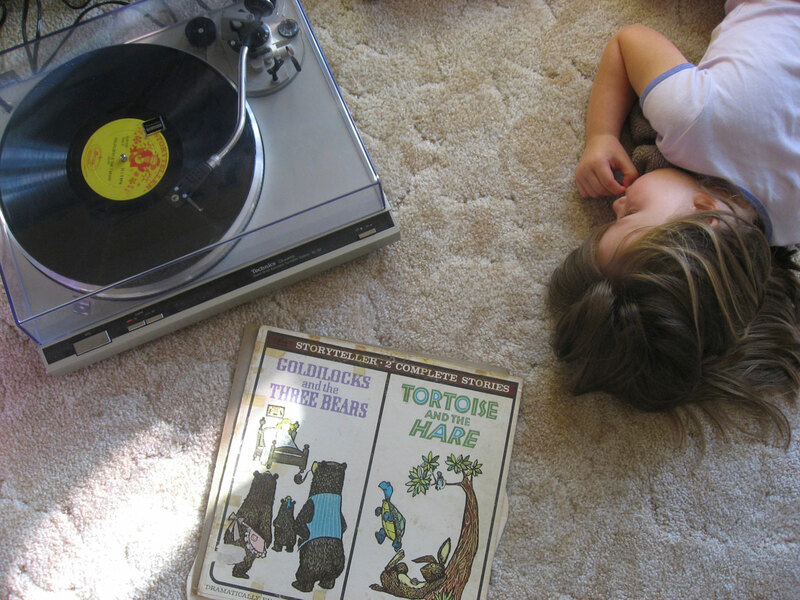 I just love the photo of your daughter listening to the LP Goldielocks and the 3 Bears. I have been there too. Last night I took my granddaughter there with my best re telling of the story ending with “don’t step on my daffodils”. I have been searching for SLP 107 since my own children were babies. Somehow I managed to raise them without it. I have searched through countless bins of vinyl. To no avail. If you could help me find the mp3 files for SLP 107 online I would greatly appreciate. You probably didn’t see this link because it was halfway down through the comments, but I found them online here: http://www.artsreformation.com/records/ . I just tried the link to make sure the page is still there and it is. I didn’t download the zipped file again but you should be able to. Thanks for commenting. I think your grandchildren will always prefer your rendering, and certainly your own children will consider “mom’s” the authoritative telling, but I hope they enjoy the originals. Good luck! We had 4 of these Mercury Storyteller records. I was born in 1970 so this was before cable, ipads, and cartoons on TV anytime of day. “Rumplestiltskin” was terrifying, but thrilling. Whenever I was sick, my mother would let me listen to all of them as many times as I wanted, laying on the couch. I did some research to try and learn about the actors, because if you listen to many of them you can realize it appears to be a handful of actors doing all the voices. Anyways, those of us who grew up with these records surely all memorized the illustrations as they were the springboard for our imagination and imagery with these stories. I too found the downloadable mp3’s on line, and have let my daughters (age 7 and 5) listen to them and they just stopped moving and stared into nothing, like you said – I watched them go, but can’t really follow. Thanks for commenting. My family only had one of these records. We had a record with Rumplestiltskin on it (terrifying, as you say), and I listened to the Rumplestiltskin MP3 on that website hoping it might be the recording I had, but it wasn’t. I did notice then that the actors were the same ones as on my Goldilocks/Tortoise and Hare record, and it occurred to me that they must have hired a troupe of actors for the series. I’m 56 and I still have some of those records. Is anyone interested in them? I’ll give them away to anyone who will pay the shipping charges. Thanks for commenting and thanks for the links. I was at the Goodwill today and bought the Robinson Crusoe/Davy Crockett lp in the series– only because I remembered the series from having the Goldilocks/ Tortoise lp as a child. My brother and I listened to it until it had cracks that made certain lines repeat over and over, which made us crack up all the more. I think we would even change the speed setting for more hilarity. To this day I can say, “Naw Chris, that’s not the way. You say ‘on your mark, get set, get ready, THEN go'” and my brother will laugh everyone will think we’re crazy. Alas, we lost the record somewhere along the way some thirty years ago. I wonder if there’s some way you could send an mp3 file of it. Ah– I should have read the other comments. Thanks for the links. I’ve just listened to it. Great memories flooding back! Glad to help, Drew. You mentioned the “THEN go!” line sticking with you. I recall being puzzled by the phrase the female bunny says to Harry Hare, and to this day I’m unsure whether she says “for a little nibble lunch” or “for a little nib of lunch”. It just never sounded right, and my mind always caught on it. I have the whole set of these 16 albums. In good shape all jackets in tact and no scratches on vinyl. What is the complete set worth? Hi Steve. Thanks for commenting. I have no idea what the whole set is worth. I would look on eBay and other similar websites to see what they’ve sold for or take them to a record store if you have one nearby. I have a feeling they may be of more sentimental value (to some) than monetary.